Friday afternoon I started feeling some chills, aches, and fatigue. By bedtime it was much worse and it was clear I was not going to be running a 50K the next day. I am positive it was the right decision (I spent almost all of Saturday in bed) but it still makes me feel bad. This is supposedly up at http://www.baa.org/news-and-press/news-listing/2011/february/boston-athletic-association-announces-new-registration-process.aspx but the BAA servers seem to be getting hammered hard this morning. Since their site is mostly inaccessible, I reproduce the press release below. The short version is this: starting in 2012 they will be accepting people not in first-come first-served order, but based on by how much they beat their qualifying time. Starting in 2013, qualifying times will be tightened by 5:59 across the board. Oh, and they’ve moved the registration dates back to September, meaning that people who qualify in a late fall marathon are once again out of luck (or at least have to wait more than a year). 2013 is when the big changes hit. The qualifying times get harder across the board. Every group will have to run five minutes and fifty-nine seconds faster to qualify. What’s up with the fifty-nine seconds? Currently, if your qualifying time is 3:30, you qualify even with a 3:30:59. They are eliminating the 59-second “grace period”, as well as lowering the nominal times by five minutes. It looks like they will be keeping the same fastest-first rolling registration process for 2013 too. BOSTON – The Boston Athletic Association (B.A.A.) announced today a change in its registration process for the Boston Marathon, allowing the fastest qualifiers to enter the earliest and with a rolling admission system while also offering all eligible runners an increased registration period. The changes in registration are a response by the B.A.A. to greater than ever demand by runners to gain entry into the Boston Marathon and culminate more than three months of analysis, including input from the running industry. Rather than accepting runners who have met the qualifying standards on a first come, first served approach, a more systematic, performance-based process will be employed. For the 2012 Boston Marathon, registration will extend for two weeks, beginning on Monday, September 12, 2011 and continuing until Friday, September 23, 2011. The qualifying times for the 2012 Boston Marathon will not change from recent past years since the standards had been previously announced and have been in effect since last September. However, the new registration process addresses the increased demand among qualified runners to participate in the Boston Marathon and will accommodate those who are the fastest qualifiers first. Registration will occur on a “rolling admission” schedule until the maximum field size is reached, beginning with the fastest qualifiers. On the first day of registration for the 2012 Boston Marathon, those who are eligible for entry by having met the qualifying standards for their age and gender group by 20 minutes or more will be able to enter on the first day of registration (September 12). On the third day (September 14), registration will open for those who have met their qualifying standards by 10 minutes or more. On the fifth day (September 16), registration will open for those who have met their qualifying standards by five minutes or more. During this first week of registration, applicants will be notified as they are accepted and their qualifying performance verified. If the field size is not reached after the first week and additional space remains, then registration will open to all qualifiers at the beginning of Week Two (September 19) and those who have met the qualifying standards by any amount of time will be able to apply for entry. The application process will remain open for the entire week, closing on September 23. At the conclusion of Week Two, those who are the fastest among the pool of applicants in their age and gender will be accepted. Accepted athletes will be notified on September 28. If space remains available after this two week process, registration will remain open to any qualifier on a first come, first served basis until the maximum field size is reached. The field size for the 2012 Boston Marathon will not represent a significant increase from the most recent years. September 28, 2011 (appx)	Qualifiers from entry during second week of registration are notified of their acceptance. If the field is not filled at the conclusion of the two weeks, then registration will remain open and qualifiers will be accepted on a first come, first served basis until the maximum field size is reached. *Unlike previous years, an additional 59 seconds will NOT be accepted for each age group time standard. Registration for the 2013 Boston Marathon will begin on Monday, September 10, 2012. Additionally, to recognize and to encourage longtime Boston Marathon entrants, the B.A.A. will allow those who have met the qualifying times and who have finished the last ten consecutive Boston Marathons to enter anytime during the registration period. Currently, there are approximately 500 runners who have run 10 or more consecutive Boston Marathons. The B.A.A. last adjusted the qualifying times for the 2003 Boston Marathon, relaxing times for runners who were 55 years old and older. The last time the qualifying times were made more stringent was for the 1980 Boston Marathon. The 2011 Boston Marathon reached its maximum field size of qualifiers faster than any previous year when qualifiers rushed to fill the race and the qualified field closed in eight hours, three minutes. The next phase in Portland’s food cart movement could wheel into an acre-sized lot on SE 82nd Avenue this summer. Food-pod pioneer Roger Goldingay is ready to roll on a bike-centric “super pod” smack in middle of the Springwater Corrider [sic] bike trail. With a vision for 35 carts featuring bike repairs, air-pumping, and gear—not to mention good food drawing from 82nd Avenue’s wealth of Asian, Latino and Russian communities—Goldingay hopes to take the cart village concept to the next level. All the same, anybody with eyes can see that Portland is in the middle of a food cart bubble, and there’s some feeling that it’s starting to burst. Just because Goldingay developed one very successful pod — Mississippi Marketplace — doesn’t mean this one is going to work out. We may know soon enough. The city has already okayed the plan. Construction — basically paving, I guess — is supposed to start in a matter of weeks, and the pod is supposed to be fully up and running this summer. I think this was the first time I’ve ever run from home and made it over to the other side of the Willamette. Getting down to the river from my neighborhood is a bit of an ordeal, because it is hard to find a route that avoid major roads or busy streets with no sidewalks and narrow shoulders. I tried to find as direct a route down as I could. I experimented by taking the 26th Ave underpass beneath Barbur and I5, but it dumped me onto a pretty scary section of Taylor’s Ferry, so I don’t think I’d do that again. Once I reached Spring Garden Street, it got easier and I was able to follow a familiar SW Urban Trails route down to the river. After that, I ran about seven flat miles, crossing the Sellwood Bridge to the east side and heading north on the super-terrific Springwater-on-the-Willamette path. A number of group runs were heading the opposite way from me in this section; I saw people I knew in two of them. Eventually I looped around back into downtown. I was hoping to find a water fountain to refill my bottles somewhere in this section. I was carrying two twenty-ounce bottles, and they weren’t running low yet, but I knew I’d need a refill sometime before I was done. But of course, every water fountain was either off or the “bubbler” style — always on, but with too low a stream to fill a bottle. I left the river and ran through the downtown streets for a bit, making my way over to the start of Terwilliger Boulevard. Terwilliger is another popular place to run in Portland: a hilly, windy street with great views, a wide asphalt sidewalk, two bike lanes, and very few cross streets. I pushed my way up the hill, enjoying the effort. The two water fountains on Terwilliger? Off. I turned off Terwilliger at Capitol Highway. Capitol Highway is not a highway, by the way, just a regular street. A few hundred yards up the hill, I came into the little neighborhood of Hillsdale, where I stopped at a gas station convenience store and bought a Gatorade. That’s right, I had actually thought far enough ahead to bring cash with me, in case all the water fountains were off. I also bought a Snickers bar, to supplement the pair of energy gels I had with me. This was between miles 16 and 17. How was I feeling? Energy-wise, I was fine. My legs felt pretty good. My foot didn’t feel good. It really hadn’t for most of the run. Sigh. It didn’t feel awful, either, and I decided to extend my route a little. If I went home by the most direct route, it would be about 20 miles; I zigged and zagged through quieter streets during the last section, and reached home with my GPS reading 21.32 miles. Total time – three hours sixteen minutes. In my last post, I forgot to mention something interesting that happened during Wednesday night’s run. It was a clear night but very dark, with a close-to-new moon, and I kept running into overgrown trees and shrubs. You would think this wouldn’t be a problem, since I should know every step of this route blindfolded by now, but what can I say? I’m a spaz. Anyway, about midway through the run a little tree branch whacked me hard on my left eye. I didn’t see it coming at all, and it didn’t seem like I had any time to blink. It felt like it hit my eyeball. But I could still see fine and I wasn’t in any kind of serious pain, so I shrugged it off. I figured I must have blinked after all. By Thursday morning I had forgotten all about it. Thursday night, though, my eyeball started feeling sore and maybe a little swollen. I looked in the mirror and could see some redness. (Probably. My color-blindness makes me pretty bad at detecting red eyeball.) I told Sweetie what had happened the previous night, and asked her to take a look. She did. She didn’t like what she saw. Phrases like “oh my god that is super-red!” and “there is a big gouge in the white of your eye!” were tossed around. I must have been looking off to the left when I ran into the tree, because the damage is way over on the right side of the eyeball. (My right). I saw an eye doctor the next day, who pronounced the wound clean-looking, and gave me some antibiotic/steroidal eye drops to use four times a day for a week. Even before I saw him, it had stopped hurting. He said I was lucky it was my conjunctiva (the membrane over the sclera, the whites of your eye) that was damaged, and not the cornea. Apparently that would have been a lot more painful. The lesson here is clear. Trees hate runners. As planned, I’ve been taking the running week pretty easy, with just six easy miles on Monday and seven not-much-harder ones Wednesday. My ankle feels like it is recovering well, though my Achilles and calf are pretty tight. I had some unusual sharp pain in the heel of my foot walking around just now, too, but I think that was probably some transient weirdness; it went away as quickly as it came. My foot didn’t hurt at all last night. 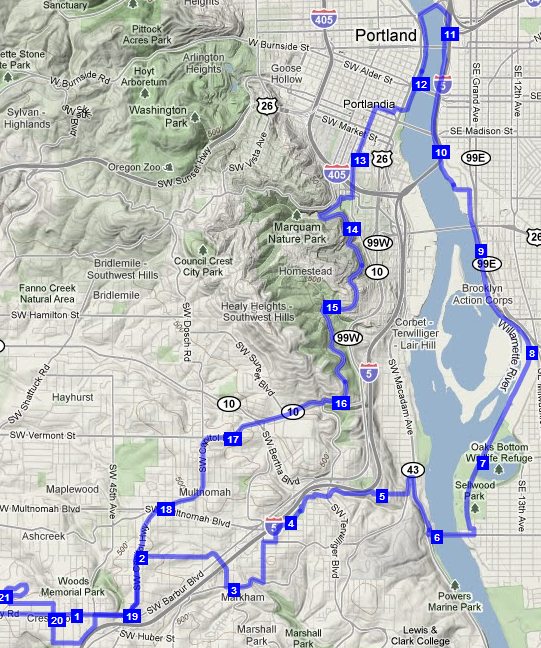 Still, I don’t think it would be wise to stick to my plan for 25 miles on Saturday. I will dial it down a bit (maybe 20 or 22) and just hope for the best at Hagg Lake two weeks after that. You are currently browsing the I'd Rather be Running blog archives for February, 2011.